Storm Flood and Water Damage – Things you should know! Storm Flood Water Damage – Shopping is worthwhile! Do you ever wonder about your home insurance? Has your premium increased recently? Call the National Flood Insurance Program (NFIP) at 1-888-CALL FLOOD, Ext.100. Or, Rapid can lead your way into stress-free storm flood water damage restoration – call us for more information! 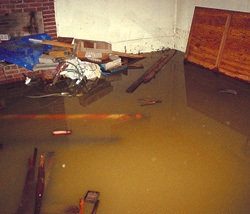 Flood damage is not covered under a homeowners policy. Many people believe the federal government will help them recover after a flood. However, most floods are too small to qualify for federal assistance. Even if the flood is qualified, often the amount the person receives or can borrow is not enough to cover all the losses. In many cases, the assistance is in the form of a low-interest loan which must be repaid and causes further hardship. If you are a property owner whose property is in a low area or near a river or lake, you may be concerned that you need flood insurance. Or, perhaps your mortgage company may require you to purchase flood insurance if your mortgaged home is located in a designated flood zone. You can find out if you are in a designated flood zone by contacting your local township office, building official, city engineer, or planning and zoning administrator. The Federal Emergency Management Agency also produces flood insurance rate maps and makes them available to agents and other interested individuals. Flood insurance will not pay a claim unless it has been in effect at least 30 days before flood damage occurs, so don’t wait until the rainy spring season before buying this coverage. Your home insurance agent can help you determine if you need flood insurance, how much you need, and what it will cost you. Agents should not charge to provide this information to you. If you purchase the flood insurance from them, they will earn a commission from their company on that policy. Many insurance companies that sell home insurance in Michigan also sell flood insurance. However, the cost should not vary among companies because the federal government sets the premium. The premium will be the same whether you purchase the policy through the agent or directly from the federal government. An agent may also be able to provide additional strategies that you can use to protect your property from flood damage. If the agent can’t provide the additional information, then you can contact the National Flood Insurance Program (NFIP) at 1-888-CALL FLOOD, Ext.100. The NFIP can provide informational brochures to you, the agent, or the insurance company so that the consumer will be better informed about the Flood Program.